We’d love your help. Let us know what’s wrong with this preview of Stormbound Surgeon by Marion Lennox. The rain is thrashing down on Iluka, and Joss Braden is bored out of his mind. In fact, the hotshot Sydney surgeon is heading out of there as fast as his sports car can take him! But the bridge is down. There's no way on or off the storm-lashed headland...not even for the emergency services! Suddenly, Joss is responsible for a whole town's healthwith only Amy Freye's nursing home as his makeshift hospital. And as Joss and Amy cope with their unexpected responsibility for a series of crises, the incredible chemistry between them becomes an emergency in itself! 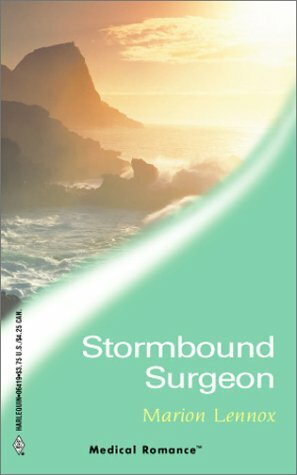 To ask other readers questions about Stormbound Surgeon, please sign up. When Sydney-based surgeon Joss reluctantly visits his family in the tiny coastal town of Iluka, he doesn't plan to stay long. But a storm intervenes, physically cutting off the village from the outside world and stranding not just Joss but also a pregnant woman in need of an emergency Cesarean. Joss may be the only doctor available, but he's not completely without help: at the local nursing home, nurse Amy manages to rustle up a surprising but efficient crack team of elderly retired health profe When Sydney-based surgeon Joss reluctantly visits his family in the tiny coastal town of Iluka, he doesn't plan to stay long. But a storm intervenes, physically cutting off the village from the outside world and stranding not just Joss but also a pregnant woman in need of an emergency Cesarean. Joss may be the only doctor available, but he's not completely without help: at the local nursing home, nurse Amy manages to rustle up a surprising but efficient crack team of elderly retired health professionals who can assist her and Joss. Amy's in a bad situation, and not just because of the storm. Due the conditions of a manipulative will (the sort of unbelievable estate planning that exists nowhere in the real world but everywhere as a plot device in Romancelandia), she's actually forced to make her life in an empty mansion if she wishes to inherit her evil stepfather's home. The will stipulates that if she fails to live there for ten years, the nursing home will be sold off to be a resort and the stepfather's evil nephews will inherit the house and money, and they'll also probably continue their uncle's legacy of ruining the town for the residents. Amy hates the isolation and the poverty of her situation--every spare and not-so-spare coin goes to the taxes and upkeep of the terrible mansion, as well as put toward her own work trying to meet the town's medical needs--but she loves the town of Iluka and loves its mostly elderly residents, and she can't let it be destroyed. The external plot is pretty laughable--it's mustache-twirlingly silly! The stepfather was fairy tale evil, and Amy is trying to make do under fairy tale martyrish conditions. But Lennox balances this out with down-to-earth personalities of the characters (Joss and Amy are hard-working and competent medical professionals, and they make each other smile and laugh frequently), the interestingness of the medical emergencies featured (as always, Marion Lennox writes the best rescue scenes--Lionel's kites, omg), and the charm of the small-town community and the reassurance of people who care and come together. This is why I love Lennox's romances so much: they situate relationships in families and in communities, never losing sight of the the human responsibility we have to each other, to help each other. Writing romance sounds fascinating. Huh? I'm a writer. I'm boring. Day after day I sit behind a word processor making up people in my head. Why do I do it? I love it. My husband, Dave, gets up in the morning, puts on a suit and heads out into the ice and cold of Ballarat's winter. (Sadly I live in one of the tiny parts of Australia that qualifies as cold.) I make myself another cup of coffee, head Writing romance sounds fascinating. Huh? I'm a writer. I'm boring. Day after day I sit behind a word processor making up people in my head. Why do I do it? I love it. My husband, Dave, gets up in the morning, puts on a suit and heads out into the ice and cold of Ballarat's winter. (Sadly I live in one of the tiny parts of Australia that qualifies as cold.) I make myself another cup of coffee, head up to my study, choose what music I want and sit and daydream. And I get paid for doing it. Hooray! My first attempt at writing romance, 'Dare To Love Again', a Medical Romance, was published by Harlequin Mills and Boon in 1990. It still stands today as a monument to my family's ability to survive on cheese sandwiches and spaghetti. I come from a farming community. You can probably tell this from my books. There's not a skyscraper in sight. I'm very much a pets person. Chloe and Harry were my constant canine companions for many years as I wrote, demanding walks and air freshener at frequent intervals. Sadly I lost them, and for a while I vowed not to get another. My heart was broken and my study smelled so clean! But.. The cat and I missed them so badly we weakened and bought Mitzi. Mitzi's a black and silver mini-schnauzer who makes me and the cat laugh. Expect to find her in future stories. If you're interested in formalities, I hold a Bachelor of Commerce degree and a teaching diploma. I have a couple of kids and a huge extended family who look on me with affectionate tolerance. Marion? The crazy one who talks to people in her head... I've had nine nominations for the Rita, winning twice, and fourteen for the Australian Book of the Year. After years of thinking of my writing as a hobby I guess I finally now qualify as a `real' writer.